dear friends, this year we are going to give the mallorca meditation festival and ourselves a rest, after 3 editions of this heartful event. we are planning something beautiful for next year though and are looking forward to seeing you there. The Mallorca Meditation Festival is an opportunity to give us some unforgettable days of connection with ourselves, with old and new friends and with the essence of life itself. It is a gathering of meditation and celebration open to everyone who wants to share, learn or deepen in meditation and other techniques and events that provide an opportunity to expand consciousness . There are many activities available throughout the day and you can choose what you want to do at all times. You can choose from different types of meditations, such as OSHO active meditations, guided meditations , book of secrets meditations or vipassana ; you can attend concerts, massage-, breath-, tantra-, family constellations- and personal growths workshops, as well as receive yoga classes and individual massage and alternative therapy sessions. You also have the chance to cool off in the natural swimming pool, to walk in the fields or take a tea with friends in the chill out area . All accompanied by healthy vegetarian and vegan food prepared with love, in a cozy atmosphere surrounded by a nature. No matter if you have spend years meditating or are new in this world. The only thing that you need is your desire to grow, discover yourself, celebrate and share. All activities will be held in spanish and english. The Festival is held at a beautiful place called Ca’n Corem (The House with Heart) near Campos and at about 20km from Palma airport. It is a renovated old farm that keeps the original Mallorcan style villa in a privileged natural enclave of Mediterranean forest and very close to one of the best beaches in Mallorca, EsTrenc. It also has a natural water pool where you can cool off during the hottest hours. All this makes the place a beautiful environment with clean and relaxing energy, perfect for this event. 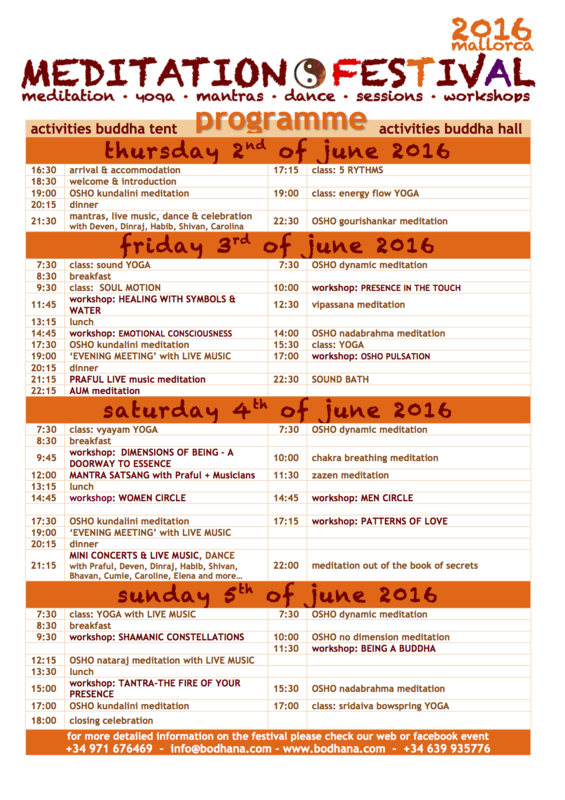 here you’ll get directed to the programme of the festival 2016. Can Corem has various apartments, clean, cosy and decorated with style. The rooms can be shared inbetween 2 to 4 people. They all have bathrooms with towels and there are bedsheets and blankets too. There will also be the possiblity to book a place in a grouproom, for a maximum of 8 people, for a more economical price. A part from the accommodation in the place itself (finca ca’n corem) or after all the beds have been booked, there is the option to reserve rooms in hostals or hotels in the area or also at Sarjans place (Can Flow). If you prefer to choose one of these options please get in touch and we’ll tell you more about it. Especially if you are coming from abroad or the other end of the island and wish to combine the festival with a little holiday, you can book rooms in Ca’n Corem before and after the event (consult prices) and do beautiful excursions to the magical beaches, country side, mountains or villages of mallorca. THE festival opens its doors on thursday the 2nd of june at 16:00, giving you plenty of time to accommodate and inform yourself about anything you need to know before the opening ceremony. It will end on sunday afternoon around 19:00 with a farewell meditation. 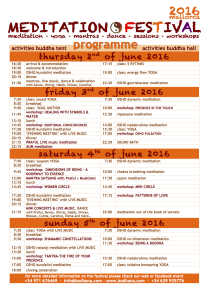 During this period you choose which ever activity you would like to participate in according to the programme. The first meditations and classes start at 7:30 in the morning and from there you can flow from moment to moment, feeling what your body and soul are asking for, until aproximately 12 midnight, when dance and celebration are ending the day. We offer a variety of delicous vegetarian and vegan food, prepared with much love so that you can enjoy some jummy, natural and balanced meals. The food has to be reserved in anticipation, whether its for the whole festival or just for one day. You can also enjoy the Chill Out area, where you can relax and connect with friends. Chai, teas, fresh fruit juices, homemade snacks and sweets, which are not incuded in the general entry fee. During the festival, wine and beer will be the only alcoholic drinks avaible. There will be a space destined for smokers, ‘the smoking temple’. Drugs are not permitted. There are different price groups, acording to the option of participation you choose. We do like to encourage you to give yourself the gift to enjoy the whole festival (which includes 4 days of activities, 3 nights of accommodation and 3 breakfasts, 3 lunches and 3 dinners), to be able to emerge yourself totally in this wonderful energy. Certainly you can also come single days and also decide whether you to include the meals(needs to be reserved previously), or maybe eat something in the ‘chill out bar’. IBAN: ES85 2100 0657 67 0200165870. BIC: CAIXESBBXXX Its very important that you specify your name and surname in the ‘concept’ box. Also send us a mail to info@bodhana.com indicating that you have made the transfer, with your details and type of participation you have chosen. 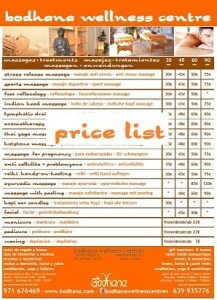 you can certainly also reserve your place directly in ‘bodhana’ in puerto portals. The place of the festival, Can Corem is about 15min drive from the airport of palma and 25min from the city centre. If you come from that direction, you take the motorway to lluchmayor/campos, drive past lluchmayor and before entering the village of campos, at kilometre 32,7, you turn left into a country road. follow this road aprox 500 metres until the end, where you see Can Corem to the right. If you come from the Campos direction, then take a right turn after LIDL and go straight ahead for around 4km and you will see Can Corem on your left. Please leave the car in the car park, after entering the gate to your right. We are going to do everything we can, to help and connect all those who are in need of transport. Apart from OSHO books and DVDs, there will be a few stands with interesting handmade products. activities, courses and workshops which help to expand consciousness. At your arrival you will receive a bracelett which will identify the type and lenght of participation you have chosen. The bracelett is certainly personal and not transferable; and it is your responsibility to take care of the correct use and state. We like to support the respect for the environment and also for the beautiful place and people who are welcoming us with an open heart; There will be ‘green spots’ which facilitate the separation of garbage; we will try to use the least plastic necessary; re-use bottles etc as much as we can; save water and certainly leave the place and the nature which surrounds it, as clean as we found it. We are keeping the festival prices as accessible as possible. Never the less, if there should be anybody going through some difficult times and cannot afford to invest any money in these days, we would like to offer some kind of exchange. Let us now what your qualities are and how you would like to support the preparation or/and development of the festival, in order to receive free participation. If you have anything to share or to introduce, like an activity, class or conference which has to do with the subject of the festival, please get in touch and we create space for that. You can change your cookie setting here anytime: aktive meditationen osho mallorca.